Keep your eyes to the skies. 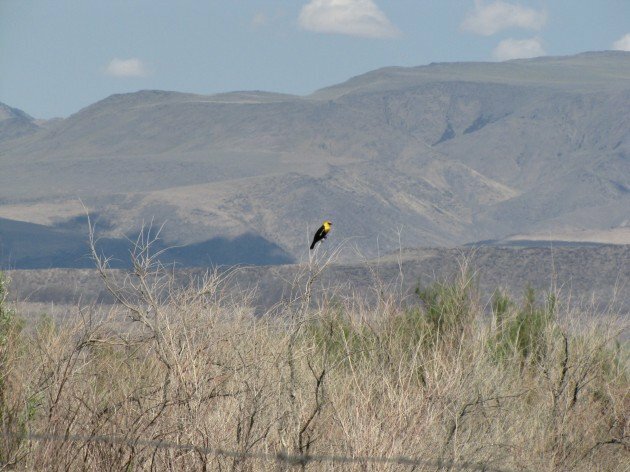 Maybe you’ll see a Yellow-headed Blackbird like Meredith did at the Spring Wings Festival! Much satisfaction in life can be attributed to being in the right place at the right time. If you like your weekends extra long, the United States looks good right about now. We’re on the cusp of a long Memorial Day Weekend that happens to span one of the most active migratory moments of the year. Wherever you are in the temperate zones, you should encounter much in your airspace, but we fortunate Americans get an extra day to enjoy the action! I’m headed down to NYC for a mostly non-birding weekend, but expect some productive outdoor activity. Corey will continue to blitz Queens for the best birds around. How about you? Where will you be this weekend and will you be birding? Share your plans in the comments below. I will be doing a bird count or two in the high elevations forests on Poas Volcano, Costa Rica. I am heading to the NW corner of Connecticut and am hoping to get some good birding in. I hear River Road in Kent is great for warblers…now I just have to cross my fingers that it doesn’t rain 24/7. Anyone have tips for that area/the Berkshires? Beautiful! And what a wonderful backdrop to display that yellow-headed blackbird’s splash of color! I’ll just be enjoying the birds in my own back yard this weekend! I’m in Sydney, doing a variety of parks and locations.